One reason why so many psychologists believe in separate, specialized auditory and visual short-term memory systems is that occasionally a patient presents with deficits that seem consistent with the selective loss of one or the other of these functions. I recently looked into this in depth because I wanted to write a review of these cases. I began by imagining that I would contrast the strength of evidence for selective auditory short-term memory deficits with far more murky instances of supposed visual short-term memory deficits. After carefully analyzing the auditory short-term memory cases though, I abandoned this plan because I was no longer sure that these patients really experienced a deficit in auditory storage exactly. Why not? Others have pointed out that functions apart from “storage” could contribute to the presented deficits, and that assuming a damaged “phonological” store cannot explain the patterns of deficit and preservation that the patients show (see Caplan, Waters, & Howard, 2012). I plotted some patterns from several documented patients said to have selective damage to auditory short-term memory, which highlight two clues that point away from a short-term memory deficit. First, it struck me that one of the tasks often used as a control to check that auditory perception was intact was exactly analogous to a whole-display change recognition task in visual memory (for a short explanation of this measure, see Rouder, R. Morey, C. Morey, & Cowan, 2011). Some patients were given an aurally-presented list, then immediately a second list that was either identical to the first or differed by one item. The patient should indicate whether the second list was the same as or different from the first. Warrington and Shallice (1969) describe this as an “auditory perception” task, and argue that KF’s good performance on this task indicates intact aural perception. This is arguably a recognition memory task, and arguably evidence that KF could maintain a reasonable amount of aurally presented information. I combined comparable measures from several patient reports to show that across many patients presenting with similar symptoms (taken from Tzortzis & Albert, 1974; Warrington and Shallice, 1969), there is not clear evidence for an aural memory deficit when tested by recognition rather than recall. 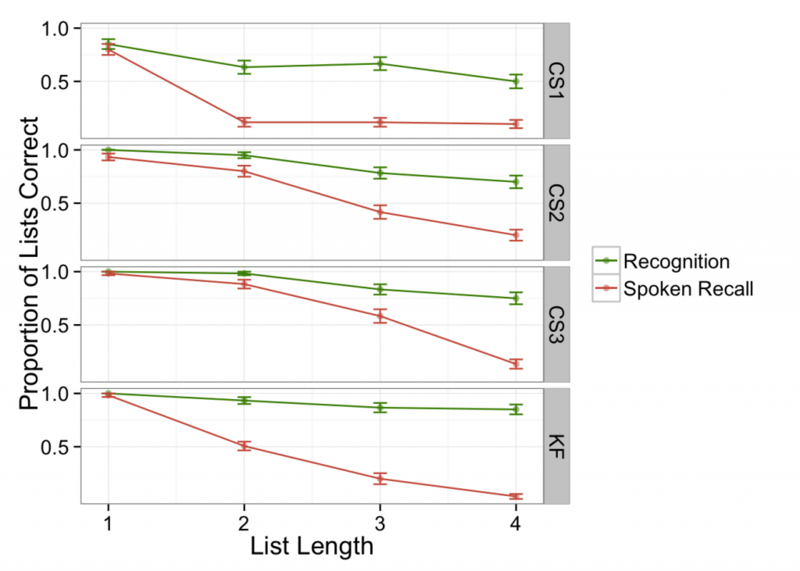 Comparison of spoken immediate serial recall of acoustically presented lists and recognition matching of two strings of the same length. Data from CS1, CS2, and CS3 come from Tzortzis and Albert (1974); data from K.F. were reported by Warrington and Shallice (1969). Data are collapsed across stimulus type (e.g., digits, letters, words) for each patient. Error bars are standard errors of the mean. 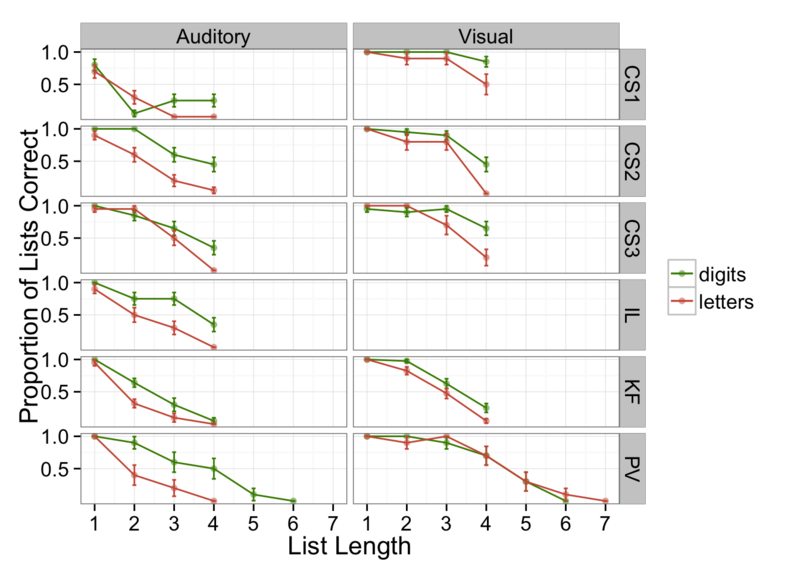 Second, I noticed that patients were quite likely to perform better on lists of aurally-presented digits than letters. This clue likewise suggests that something besides storage per se is affected. Digits come from a more restricted set (i.e., a set of 10) compared with letters (assuming all consonants were possible, a set of 21), making the possibility of guessing correctly greater with digits than letters. In English, there is also more phonological similarity among uncontrolled sets of consonants than among digits; these differences in recall may therefore arise from uncontrolled phonological similarity effects. Either way, that rather suggests a problem at retrieval, not with storage exactly, and furthermore, similar effects would be expected in healthy individuals (e.g., Jones & Macken, 2015). The plot below shows spoken recall with digits and letters, for auditory and visual stimulus presentation (patient data from Basso, et al., 1982; Saffran & Marin, 1975; Tzortzis & Albert, 1974; Warrington & Shallice, 1969). Repetition task with auditory and visual presentation and various list lengths, with patients described by Tzortzis and Albert (1974), Saffran and Marin (1975; note that this patient was not tested with visual presentation), Warrington & Shallice (1969; 1972), Basso et al., (1982) respectively. For each patient, all of the available data for recall of digits and letters at the standard 1 item per second presentation rate was combined for analysis. Error bars are standard errors of the mean. Re-consideration of this evidence led me to doubt a claim that is practically a canon of cognitive psychology, that selective deficits seen in rare patient cases prove that auditory and visual short-term stores must be distinct. I now think there is likely another explanation for the patterns of performance observed in these individuals, and that they should not be taken as definitive evidence for aural and visual short-term memory modules.